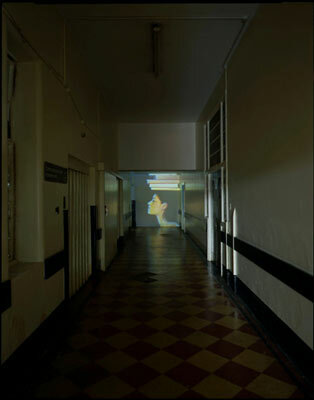 The opportunity to create this exhibition came out of discussion with Lynn French, Art Therapist at Hackney Hospital. 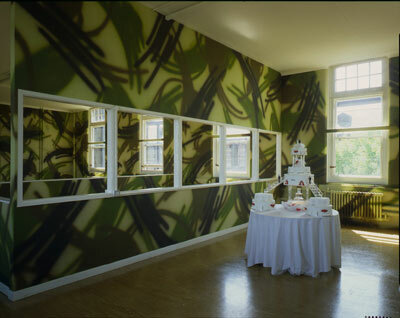 We discovered that it would be possible to slot our own exhibition into the larger decommissioning programme of the Hospital as it moved from its present site at Hackney Hospital to its new wards and offices at Homerton Hospital, and other sites around the Borough. 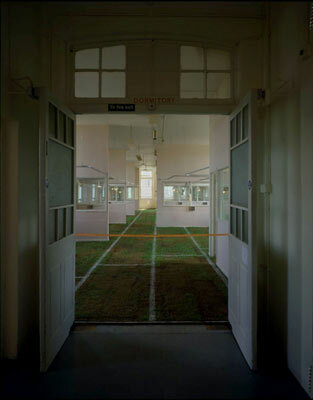 The choice of particular sites at the Hospital, the timing of the decommissioning programme and Rear Window’s own temporary occupation of the sites, were all made possible thanks to the active involvement of Hospital administrators, particularly Linda Carter, Jim Keown and Sheila O’Hara. It was important, for practical as well as aesthetic reasons, to place the exhibition in this period of transition, between full operation and final closure. It has been a privilege for Rear Window to participate in such an important moment in the life of an institution, and to be involved, however incidentally, in a phase of hopeful change for the future. Behind words, and the works, lies more than a year of preparation, negotiation, conflict and resolution. Our simple pretext “How can art address illness and specifically mental illness?” grew and multiplied into a bewildering and unfamiliar landscape of ideas, issues and histories. Behind the psychiatric service user hides the lunatic; behind him or her, the pauper. In fact, the Hospital has been a Workhouse and behind the civic duty of Community care hides the spiritual imperative of Charity. Rear Window’s own programme of questioning the presentation of works of art moved into a place where the politics are different, the stakes higher, the possibility of failure more vividly linked to personal betrayal and exploitation than in the usual terms of contemporary art practice. The process of negotiation, dialogue, and misunderstanding, planning and evolving that has involved so many people has been, in many ways, the most important part of working on the project; the part that can never be seen or properly recorded. In an ancient institution ending its days as an acute psychiatric hospital, the assumption of equality that is the basis for polite dialogue, certainly for collaboration, has often been faced with much darker realities. Everyone involved in the project has worked far beyond their usual boundaries. Most of all, we would like to thank the hospital users for their commitment, inspiration and their emotional generosity. The hospital staff on every level have been long-suffering, untiringly helpful and imaginative, generously making every area of their services available to us. Artists have responded to a difficult site with work, which is sometimes as risky as the emotions coming out of illness. Rear Window Trustees have been unfailingly patient with project and funding changes. Our work with Hackney Arts Initiative has involved them in a constantly expanding brief and continuous pressure; their flexibility and attention to detail stand out in what has been a very fruitful collaboration. In a place where you might expect to find only sorrow and conflict, we have worked in an atmosphere of warmth, human contact, and unspoken understanding.